Replacing short-term pain relief injections with long-term physical and psychological rehabilitation programmes could help tens of thousands more patients cope with debilitating back pain, according to a new Getting It Right First Time (GIRFT) report on spinal surgery. Lower back or radicular pain (sciatica) is the primary cause of disability in the UK. It affects one-third of the population at any one time, and 84% of people in their lifetime. The latest GIRFT national report found that, despite NICE guidance, a significant number of patients are still receiving facet joint injections (injections of local anaesthetic and/or steroids to block pain), which have limited clinical value. On average between 2015 and 2018, almost 6% of patients with back pain received three or more facet joint injections in a year, at a cost to the NHS of £10.5m. Reinvesting this money in longer-term physical and psychological rehabilitation programmes – close to patients’ homes – is one of the key recommendations in the GIRFT report. This is in line with the National Low Back and Radicular Pathway, endorsed by NICE. A series of 22 recommendations bring opportunities to improve the patient experience through earlier discharge from hospital, reducing cancelled operations and ensuring trusts are equipped to deliver the best care in the most-timely manner. It is estimated the recommendations could deliver cost efficiencies of up to £27m. Better recording of implants, their use and patient outcomes. The report’s author, Mike Hutton, a consultant spine surgeon at the Royal Devon & Exeter Hospital, visited 127 spinal units across England in his review. Mr Hutton said: “During my visits, I have been repeatedly struck by the passionate commitment of the clinical staff towards the NHS as a force for good in society. The majority of units expressed pride in their work, a sense of ownership of their unit and a loyalty to the communities they service. They do so, however, under significant increasing demand on their services and financial constraints. Health Minister Stephen Hammond added his support. He said: “This is a significant step forward in the way the NHS cares for people living with spinal conditions, focusing on rehabilitation rather than just relief to improve patient experience and lead to better treatment outcomes. Dr Kathy McLean, Executive Medical Director and Chief Operating Officer at NHS Improvement said: “As the Long Term Plan states, we are committed to supporting NHS trusts to learn from one another and to make changes that will both benefit patients and free up funds that can be invested back into frontline care. 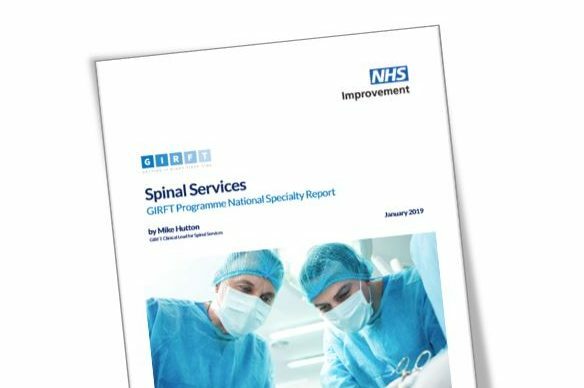 The recommendations in GIRFT’s spinal surgery report are endorsed by the UK Spine Societies Board, the British Association of Spinal Surgeons, the Society of British Neurological Surgeons, the British Orthopaedic Association and the National Back Pain Pathway Clinical Network. They will be implemented in partnership with NHS Improvement and NHS England, as well as directly with hospital trusts and Sustainability and Transformation Partnerships. Professor Cliff Shearman, vice-president of the Royal College of Surgeons said: “Chronic back pain and spinal conditions can cause serious physical discomfort and be very distressing for patients.